By: Boies, David and Olson, Theodore, B. On June 26, 2013, the Supreme Court of the United States issued a pair of landmark decisions, striking down the Defense of Marriage Act and eliminating California's discriminatory Proposition 8, reinstating the freedom to marry for gays and lesbians in California. 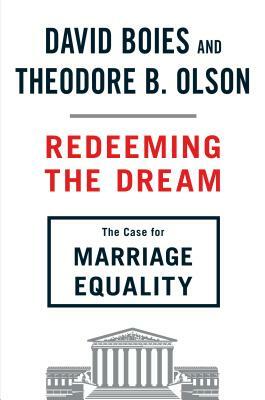 In "Redeeming the Dream," David Boies and Theodore B. Olson--two of America's foremost le-gal titans, who battled all the way to the Supreme Court in "Bush v. Gore"--tell, as allies and not foes, the fascinating story of Proposition 8. From its adoption by voters in 2008, to the federal legal challenge waged against it in a historic trial that declared Proposition 8 unconstitutional in 2010, to its rise on appeal and victory before the highest court in the land in "Hollingsworth v. Perry "in 2013, Boies and Olson are unmatched in telling the story of the journey of defeating Proposition 8. Boies and Olson guide readers through the legal framing of the case, making crystal clear the Constitutional principles of due process and equal protection in support of marriage equality, while explaining, with intricacy, the basic human truths they set out to prove when the duo put state-sanc-tioned discrimination on trial. "Redeeming the Dream "offers readers an au-thoritative, dramatic and up-close account of the most important civil rights issue--fought and won--since "Brown v. Board of Education "and "Loving v. Virginia." Author Name: Boies, David and Olson, Theodore, B.